Immortalize Your Love in The Big Easy Kickstarter This Valentine’s Day! 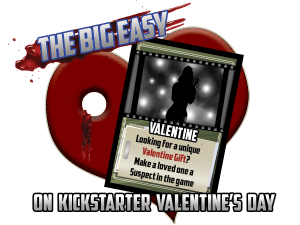 This Valentine’s Day don your fedora, head over to Kickstarter, and get ready to show your sweetheart you mean business in The Big Easy! The Big Easy from Last Lion Games*launches on Kickstarter at noon Eastern Thursday, February 14, and there are limited* reward levels available to put your friend, family member, or significant other’s likeness on a Suspect card. Gumshoes the world over will seek them out as a femme fatale or tough guy! The Big Easy is a brand new competitive card game for 2–4 players designed by *John Goff*(Deadlands Classic*and*Reloaded,*Deadlands: Hell on Earth*Classic*and*Reloaded,*and many others) and set in the universe of Deadlands Noir. Each player takes the role of a private detective trying to solve a nefarious crime. *All players use communal decks as they try to gather the clues they need to solve the mystery. *You win the game when you have a Suspect, Motive, and Evidence Clue card in your case file and reveal them to accuse your Suspect of the crime. Check out the teaser video of The Big Easy from Games Previewed, visit Last Lion Games to sign up for their newsletter, and get ready to pledge your support for the game on Kickstarter at noon this Thursday (Valentine’s Day)!